Plans for a multi-million pound spur line from the main tram route being built in Edinburgh have been shelved. BBC Scotland news website has learned line 1b, which was to run from the city's Haymarket to Granton, is being dropped by the city's council. Project managers said the economic downturn was to blame for the proposals being postponed. The line was planned to service new developments being built at the city's Waterfront. The capital's tram project manager, Transport Initiatives Edinburgh (Tie) and Edinburgh City Council, would have secured a fixed price of £87m to build the 1b line, if they could have committed to the project by this month. Jenny Dawe, Edinburgh City Council, said: "It is disappointing that in the current recession monies are not available to fund line 1b. "We will revisit this as soon as economic conditions improve. "Experience elsewhere also suggests that, once operating, trams prove immensely popular with residents and businesses and create real demand for expansion. 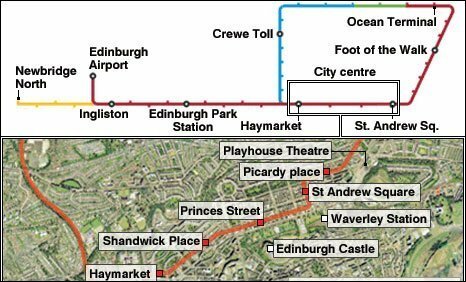 "I am confident that this route will be the first of a world-class integrated public transport network for Edinburgh, including Line 1b and line 3 to Little France." Tie chairman David Mackay said: "The global economic recession has not spared Edinburgh and as such I believe that it is prudent to postpone line 1b until such times that the climate for development is far more favourable. "Our focus in the meantime is the delivery of line 1a and the creation of a world class integrated public transport network for the people of Edinburgh."